Foreign-born workers, almost all of whom were born in Mexico, can be authorized or unauthorized. The NAWS reported that over half of crop workers were born outside the US over the past two decades, rising from 60 percent in the early 1990s to a peak of over 80 percent in the late 1990s and then dropping to 70 percent in recent years. 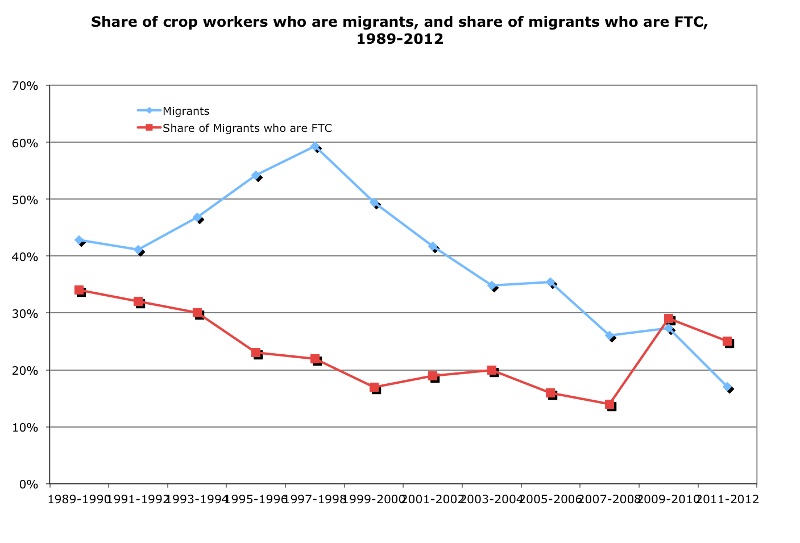 The unauthorized share of all crop workers, US- and foreign-born, rose from less than a quarter in the early 1990s to half by the late 1990s, and has remained at about 50 percent since.